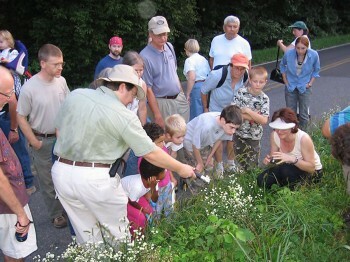 To many, the late summer chorus of insects is experienced as disembodied sound — a plethora of trills, scrapes, shuffles, buzzes, ticks, and chirps, that spring like magic from grass, shrubs, and trees. With few exceptions, the insect musicians themselves are difficult to find. Many are small and well camouflaged in their green and brown coats, and they sit motionless when they sing, blending into their surroundings. Some hide under or behind things, and many sing only in the dark of the night. So how does one find them? How does one catch a glimpse of the singers that are producing these wondrous sounds? Finding singing insects is both challenging and fun. The majority have high-pitched songs, so good hearing is a necessity. And sharp eyes are an asset, aided by LED flashlights when you’re hunting at night (the spectrum of the light from LEDs seems to make seeing and finding these insects easier). The first step is to home in on the general area in which an insect is singing. Tilt your head from side to side if you’re confused about where the sound is coming from, and cup your ears when you do this, for more precise directionality. A slow and careful approach is also advised, because many insects will jump or hop away when disturbed, or else quit singing and move to the back of a stem or leaf. Move toward the singer while spiralling around his perch, or else try to triangulate his exact location by pointing at him from one position, then moving off to the side and pointing at him again — the insect is located where the two directional lines intersect. Triangulation is particularly useful at night. Two people can approach a singer from different directions. If both shine their flashlights at him at the same time, the insect will be located where the two light beams cross. 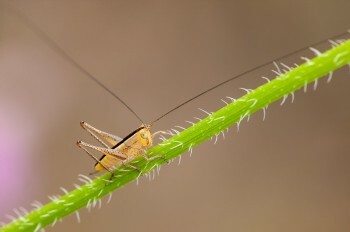 These techniques work well with insects that sing from grasses, weeds, and shrubs. But finding arboreal species is another matter. Sometimes, males can be found singing on low branches. And for those that sing from small trees, you can lay out a sheet below a tree and shake the tree vigorously, in the hope that the singer will fall to the ground. Look around after severe rainstorms that may have knocked individuals from their perches. In addition, many arboreal species are attracted to lights, and they may show up on your front porch at night, on window screens, or around illuminated food and beverage vendor machines. Once you locate a singer, what are you going to do with it? You might only want to watch it. If you sit quietly and wait, many species will relax and begin singing, so that you can observe the singing posture and especially the movement of the wings. You might also want to collect a singer, so that you can get a closer look and perhaps take him home for further observation. Using a container with a tight-fitting lid, you can maneuver the opening toward the insect, with the lid positioned on the opposite side. Then, with a quick motion, close the container around your quarry, perhaps including a little vegetation. Many singers can actually be enticed to jump right into the container. Be careful not to injure the insect, or accidently pin him between the lid and the container. Other techniques are also useful, such as sweeping through grass or weeds with an insect net. Most entomologists agree that insect populations are unaffected by small-scale collecting, so you may want to catch males of several different species and transport them home to create a personal “orchestra of insect musicians” that will fill your home with their songs. You can transfer captured insects to simple screen cages that look nice in a household setting. 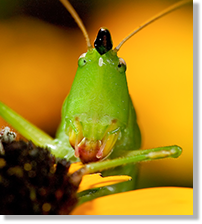 Cicadas should not be kept as pets because most die quickly in captivity, but most crickets and katydids adapt well and seem to thrive on a simple diet of iceberg lettuce and dry cat food. If you bring singing insects into your home, be sure to choose species with songs that appeal to you. 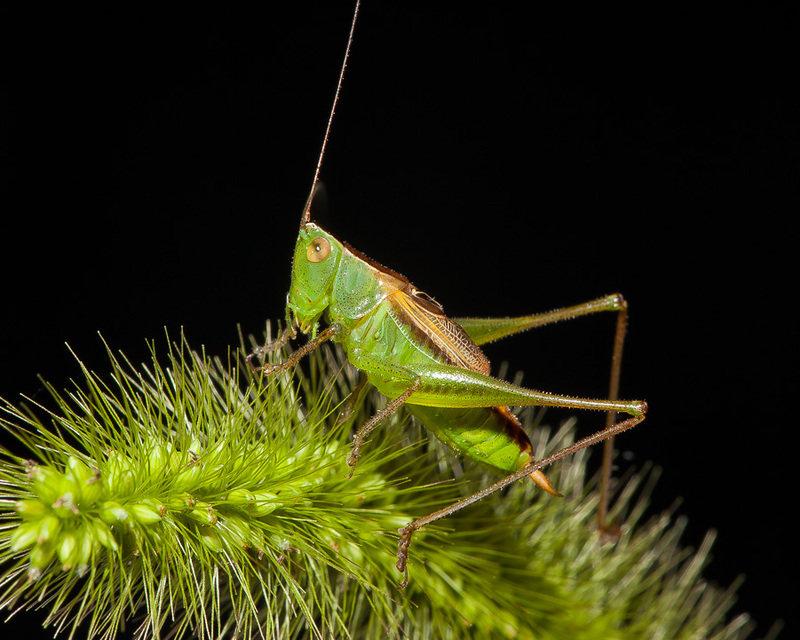 Crickets with delicate trills and chirps are quite pleasing to the ear, as are the high-pitched shuffles and ticks of various meadow katydids. While the Common True Katydid sings too harshly to keep as a pet, many of the false katydids have pleasing and intermittent songs. The coneheads are to be avoided. While their appearance is interesting, their songs are generally loud and harsh and will drown out the other instruments in your insect orchestra. For a list of species that make good pets, along with instructions for building an attractive cage and tips concerning the proper care of captive insect singers, see Keeping Insects as Pets. Calms nerves revives mind and valtrex generic dose Revives libido intensifies Relaxes mind..